It occurred to me how different the birth of our little boy will be compared to Rozlyn's birth. I didn't have an ounce of fear going in to deliver Rozlyn. The 41 weeks before Rozlyn's birthday, I never worried how it will go or what if it don't go like I imagined. But with this little boy, I'm scared to death. Each day, I wonder how am I going to get this job done. And that fear spawns from the fact that I will be delivering in an entirely different environment than I did with Rozlyn. It will be interesting to record and compare his story, as well. This is Rozlyn's. With Rozlyn, I spent 9 months getting to know my midwives and focusing on the amazing power of natural child birth. Over that time, fear never crept in but yet a sense of overwhelming ability on my part to be able to follow through with what I set out to do: deliver the baby without medication and in a relaxed atmosphere. With everyday that drew closer to my due date, I felt more like Superwoman. Little did I know that those 10 months before delivery could not prepare me enough for the intense, drawn out labor that was before me. My due date, March 11th, came and went. It was no big deal to me. I never once wanted Rozlyn out. I loved how I could protect her like no one else. I knew her and no one else did. I felt exclusive and I know my time when it was us as one would be over soon enough so it was fine by me at the took her sweet time and picked her own birth date. Two days later, March 13th, it began. The bloody show started. The excitement ate away at me and Mark was in disbelief that it was actually time. This was the day we'd meet our baby. I called my midwife, Polly, and we met at the birth center. She checked me and I was maybe a 1. She said to give it some time and come back when they open. We did just that. When Janet checked me, I was still only 1 centimeter. No big deal. I'll go home and wait it out. The contractions were bound to pick up, right? Wrong, this was not labor. It was something far worse than labor. Something that was not productive and it wasn't getting me any closer to meeting my little girl. I just didn't know it yet. Over that first day, the contractions did pick up. Every 2-9 minutes. And they were intense. Not long but intense. But not unbearable either. I worked through it all. I went grocery shopping. I made dinner. I slept as best as I could. The next day felt worse. So I went in. I was checked again. TWO CENTIMETERS! Why wasn't I getting anywhere? This thought didn't bother me as much as the fact that I was more annoyed by this little contractions more than anything else. Janet told me to go home, drink lots and lots of water (to the point that I felt sick), and check in that evening. She thought maybe I was dehydrated and the contractions were from my body yearning to be watered rather than deliver a baby. True enough, drinking water did help me some. But it did not stop the contractions like she expected. At this point, we did not sleep. While it ate away at Mark and depleted his energy supply, he stood by my decision and let me continue on. Janet checked me again the next day. No progression. But they hooked me up to an IV to try to hydrate me some more and gave me phenergan to try and get me some rest while they monitored the contractions to see exactly what they were doing. I never felt helped get me any rest since all the fluids made me have to pee every 20-30 minutes but I guess gave us some insight on the contractions. After 2 hours, I was unhooked and Janet gave me a little talk before sending me home. Not a little pep talk like you would expect a midwife to give you. One that actually offended me and pissed Mark off a great deal. She didn't blatantly say it but implied that most people wouldn't notice these small contractions but I was just being overly sensitive and needed to ignore what my body was doing. I think this was the point that Mark was actually over it all and just wanted to go to the hospital. But being the amazing man that he is, he never told me that because he didn't want to influence my decision and wanted me to do what I wanted. 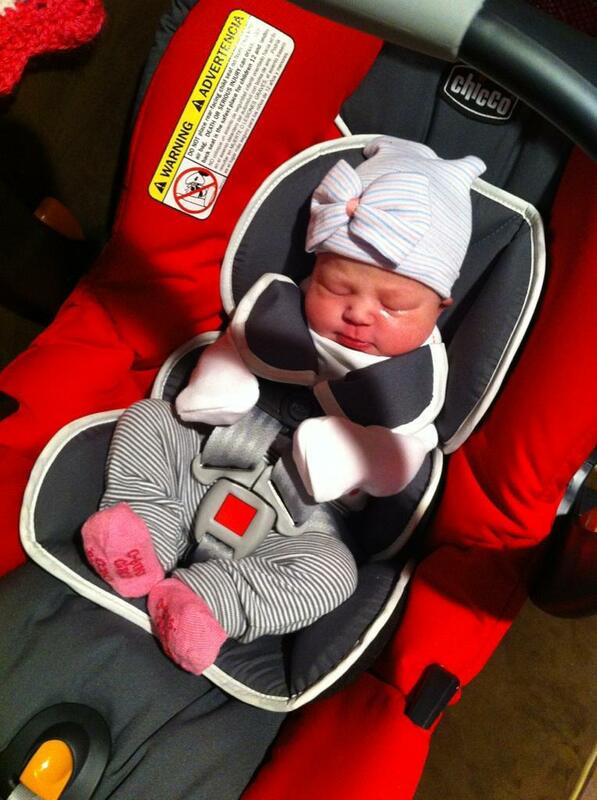 That drive home was even more irritating than the constant contractions I'd endured over the last 3 days. I constantly heard Janet's voice making me feel like I couldn't do this. We discussed going to the hospital. Mark wouldn't say that's what he wanted but just let me know that if that's what I want that I should go soon instead of making my body continue to be beat up on internally. After we got home, I took a bath to ease some of the back pain and laid down. My parents came by and I finally had a meltdown. At that point, I decided I would go to the hospital the next day if nothing happened over night. It's not what I wanted but actually making that decision did give me a little relief. At least I knew that at the hospital, this torture would end and I would have my baby in my arms. While my parents were there, something bad happened. Not to me. But to my precious Stu. He experienced his first seizure. I'm not sure what all happened. I just heard Mark freaking out and running out the door with him. I panicked. My dad was talking to me at the time and tried to keep me in bed since he didn't know what was going on but I knew what I heard wasn't right. My emotional meltdown went into overdrive. I was crying so hard that I could barely stand on my own. My parents tried to console me while Mark was gone. Luckily, the vet clinic is only about 5 minutes from our house and this all happened just before they closed. Mark was gone about 30 minutes and Stu came back okay. They gave us valium in case he had any more episodes but he was okay for the time being. I guess all the stress from this labor fiasco was getting to him too. And I assume this is when active labor kicked in. After Mark and Stu got back and we got Stu settled in with lots of love and cuddles, we called the midwives. Mark ended up telling Polly what we decided to do; that is, to go to the hospital. She asked to talk to me. Hesitantly, I took the phone. She said she could tell something was different in my voice and convinced me to come in one last time and we would go from there. Since it was Polly, whom didn't make me feel like I was being a sensitive sissy, I agreed and we met at the clinic at 10 that Thursday night. We arrived promptly at 10 o'clock and Polly was there waiting at the back of the birth center for us. She knew this was it. 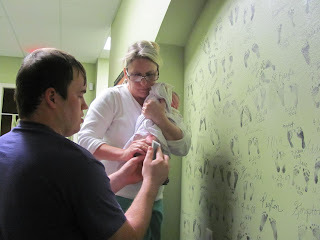 As we walked in, I had to stop for a contraction in the hall way leading to my birthing room. She coached me through how to productively work through each contraction at the point. She made me feel comfortable with moaning and yelling through it. One thing I learned through that first coached contraction that most people I retell my birth story to don't understand is that moaning and yelling isn't a bad thing. It's not embarrassing, although many people's reactions could definitely make you feel that way. It's not a yell or moan in pain but yet a yell and moan in productivity. It's from a deep, hidden spot that aids in pushing the baby down and out. 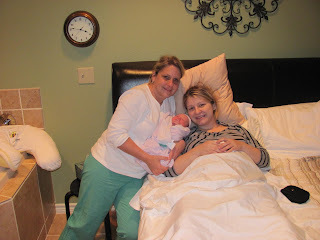 We spent 8 long hours that night rotating from the tub to the birth ball to the bed. I walked all over the clinic. I worked as hard as I could to get Rozlyn out. At some point during my time there, each of us got to a point that we still thought I might end up at the hospital. Polly felt it was 8 centimeters when the contractions slowed and my exhaustion shone through. Mark felt around 9 centimeters when I had a bout of being too tired to work through some of the contractions. And I felt at just before 10 centimeters when it seemed like I couldn't make it over that hump to 10 and to get to push. Ultimately, I got through it. Throughout my time there, and especially during those tougher times, they'd check Rozlyn's heartbeat to make sure she wasn't getting stressed. Never once did her heartbeat dip. While Momma trooped on, she was just hanging out. And though the 8 hours of active labor wasn't nearly as bad as the unproductive prodromal labor, as they called it, I was now ready to get this baby out. So finally, at 12:50 that Friday morning, I made it to a 10 and though Rozlyn never turned, it was time to push. I pushed long and hard. After 30 minutes, at 1:20, our angel made her appearance. 3 days of prodromal labor, 8 hours of active labor, 30 minutes of pushing, and delivering my baby sunny-side up. 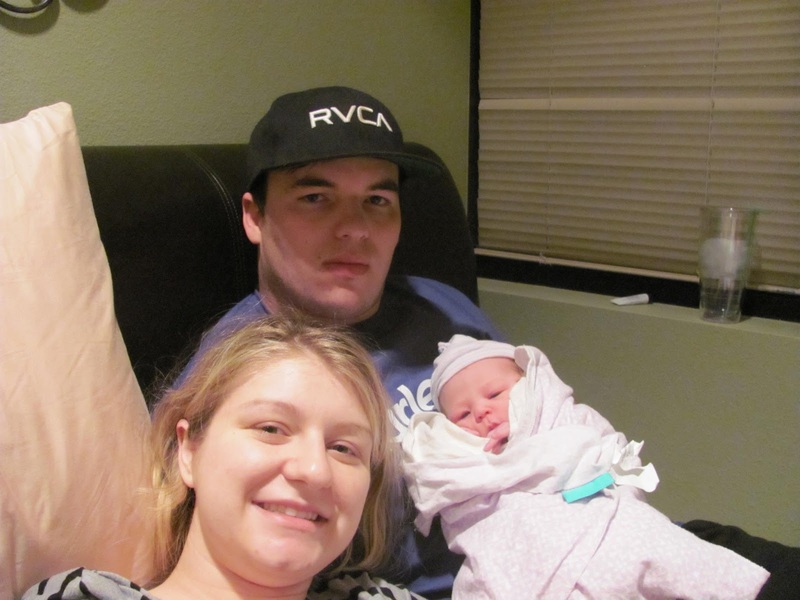 Rozlyn Chevelle had arrived on March 16, 2012, weighing it at 8 lbs and 20 inches. long. Then 3 hours laters, we were on our way home. Two extremely tired parents and a brand new baby. My name is Lynzi. I'm Mark's wifey. 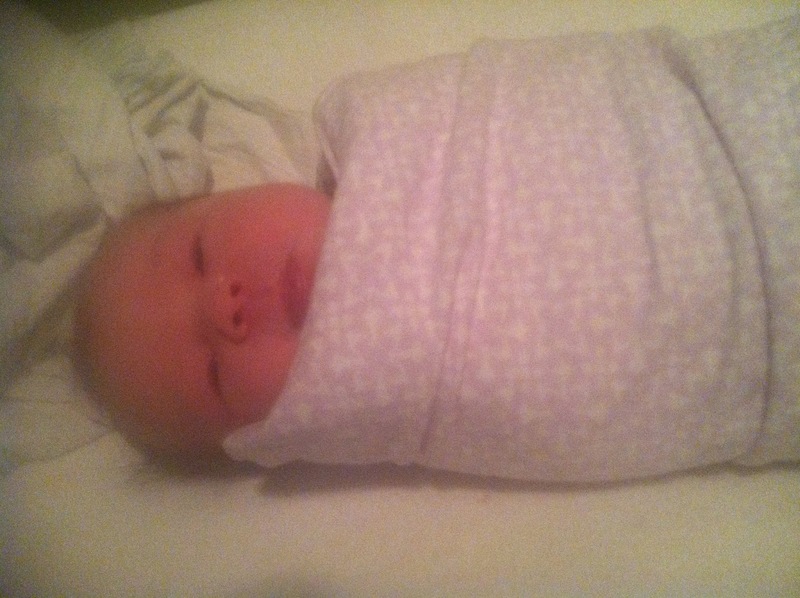 Our first little bundle of joy [Rozlyn Chevelle] arrived March 2012. We are expected our second little one in June 2013. We have a baby doberman [Presley] and baby wiener dog [Stewart]. We live in a beautiful house in Huffman and are creating a home for us to share forever.